Does anyone know what bird species this is? Thank you, Marinus, for sending this picture to us. I think it looks like a young Robin, but perhaps one of our readers will know. 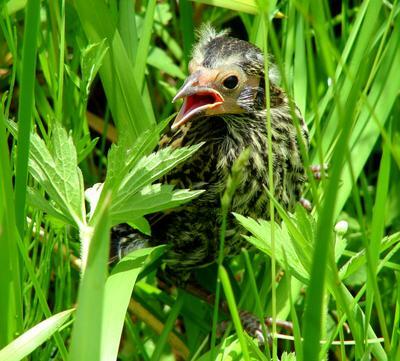 Maybe a young Red Winged Blackbird. Even the vegetation around him looks like marsh land grass, or rush. That looks like a baby Robin to me as well. I have Robins nesting at my house every year. Such devoted mothers they are.